A typical Android smartphone, the Samsung I9001 Galaxy S Plus has a phonebook with complete functionality and practically unlimited capacity. It's the Samsung customizations that give it an edge against competitors using the same platform. Swipe gestures are an important part of that. In the main contact list, or any other list with names and numbers, a swipe to the right on a name will dial the contact’s default number, while a swipe to the left will start the New message interface. There are many details that you can assign to each contact, but it still remains perfectly organized. You have all the types listed (numbers, email addresses, etc) and there's a plus sign on the right - clicking it adds another item of that type. Pressing the minus sign under it deletes the unneeded field. Of course, there’s also quick contact pop-ups but those require two clicks rather than a swipe. On the other hand they also offer video call and email as options. The handset displays the phone memory, SIM-stored and all Google contacts in the phonebook. There is a dedicated setting for that, so you really can have all of your contacts gathered in one place. You can search the entries by either sweep-scrolling or using the alphabet scroll at the side of the screen (another Samsung-made feature). 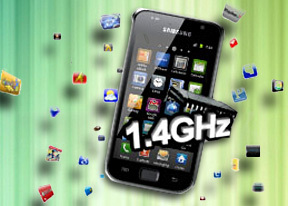 With the Samsung Galaxy S plus, we had no reception or in-call voice quality issues. Smart Dial is enabled, one of the best implementations we have seen at that. The I9001 Galaxy S Plus searches both contact numbers and names. The number of matches found is displayed next to the first pick and if you press that button the whole list will appear. Thanks to the proximity sensor, your screen will automatically turn off during a call. The available options during a call include taking a note, using the keypad, muting, holding the call or adding another call to the conversation. The call log is the tab next to the dial pad. It shows all the dialed, received and missed calls in one list sorting your call history by contacts. There’re also favorites and frequent contacts lists that show your starred contacts alphabetically and the numbers you have called most often by number of calls. We ran our traditional loudspeaker test on the Galaxy S Plus and it scored a Good mark, which places it above the original Galaxy S. The sound is a little bit louder and you won't miss any calls even in loud environments. You can find more about the testing procedure here. The messaging section is quite straightforward - there are no folders here, just a new message button. Under that button is a list of all your messages organized into threads. Swiping on a message header will do exactly the same as in the phonebook – a left swipe starts a new message, while swiping to the right will start a call. There’s an application-specific search feature that lets you quickly find a given message among all your stored SMS and MMS. To add message recipients, just start typing the corresponding name or number and choose from the contacts offered. Any unsent messages and drafts are marked with a "Draft" label so you can tell them apart from the rest. What we really like is that each thread keeps the text in the tap-to-compose box even if you exit without sending or explicitly save it. When you add multimedia content to the message, it is automatically converted into an MMS. You can just quickly add a photo or an audio file to go with the text or you can choose to go into a full-blown MMS editor, depending on your needs. Input options include the standard Samsung keypad which is easy to use and the Swype keyboard, which lets you type in words by dragging a thumb over the letters the word comprises of. If you swipe-in a word that crosses characters with another word Swype automatically pops-up a prompt to choose the one you need. Moving on to email, you get a generic email app and a dedicated Gmail app. They both work great and get set up in a matter of seconds. Both support multiple emails and mass delete, forward, move, etc.